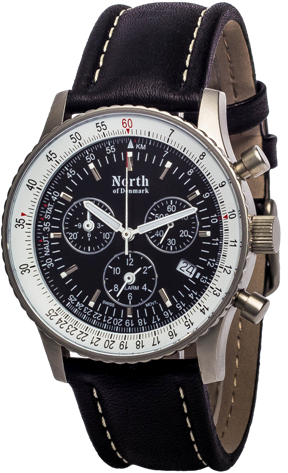 With the TransAtlantic pilot watch we have elaborated on the classic pilot watch with E6B computer introduced in the 60ies. The watch has a rotable bezel/lynette with which all different conversions can be made. This includes conversion of currencies (eg. from GBP to EUR and back). 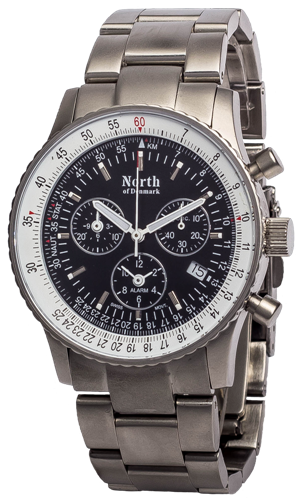 The watch is fitted with one of the best analog / quartz movements on the market; the Swiss Ronda 5130 D which is the alarm version of the famous movement 5030 D used in the NOD Endurance watch. The watch has extended stopwatch function with lap-time possibility and time measurement up to 11H 59M and 59S. The watch is fitted with scratch-resistant sapphire glass and has extra gaskets and reinforced house to give increased water resistancy. 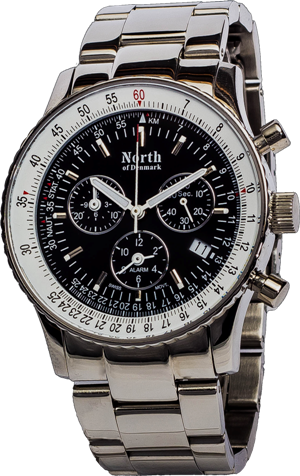 The watch is very easy to read both in bright daylight and pitch black darkness. 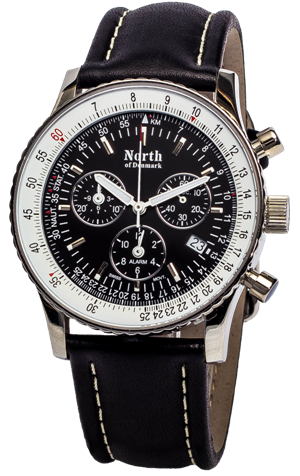 The watch comes with an exclusive steel bracelett and a black water repellant leather starp with white stitchings. The watch is available in both a shiny and a matt version. Push-buttons with the right "touch-and-feel"